The Australian Dollar, affectionately known as the “Aussie Dollar”, is the official national currency of the Commonwealth of Australia and its associated territories. Despite Australia’s relatively low population when compared to the world’s larger economies, the Aussie Dollar competes very well on the international market. The Australian Dollar is currently the fifth most traded currency on the world’s foreign exchange markets. The Australian Dollar is also used in territories surrounding Australia including the territories of Christmas Island, Cocos (Keeling) Islands, Norfolk Island. The Aussie Dollar has even been adopted by the foreign nations of Kiribati, Nauru and Tuvalu. Australia is also well-known for printing the national currencies of nations such as Bangladesh, Brunei, Canada, Chile, Indonesia, Kuwait, Malaysia, Mexico, Nepal, New Zealand, Papua New Guinea, Romania and Western Samoa. While the Australian Dollar is a relatively recent addition to the group of major players on the world’s foreign exchange market, the currency has held a level of financial strength throughout the years. The Aussie Dollar has typically held a value similar to the Canadian Dollar. At this time, the Australian Dollar currently runs a close fifth in terms of international holdings, sitting directly behind the Canadian Dollar at two percent. The strength of the Australian Dollar is found primarily in the stability of the Australian banking sector as well as the Australian economy and political system. Australia also produces a large number of the raw materials required for use in the manufacturing sector. The Aussie Dollar is a relatively young currency, created in 1966 after Australia transitioned to the decimal system. Australia operated on the British Pound Sterling throughout the nineteenth century until 1910 when Australia adopted the Australian Pound. It was at this time that the Australian government disallowed the printing and circulation of state currencies. The newly formed Commonwealth Treasury would assume these responsibilities. The Australian Dollar currently has six primary coins in circulation (5c, 10c, 20c, 50c, $1, $2) as well as a number of special collectors and commemorative coins. 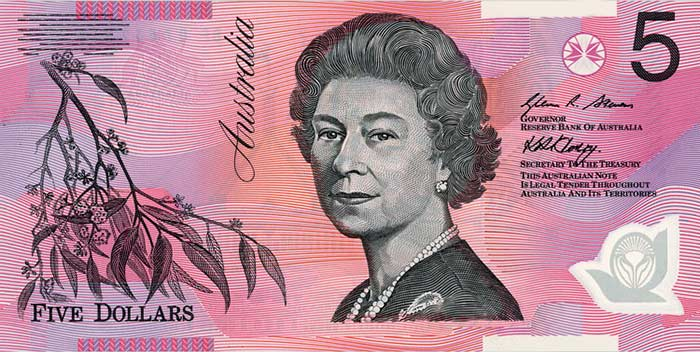 The Australian Dollar also has five bank notes in $5, $10, $20, $50 and $100 denominations. Australia also plans on releasing new paper currency in the future with increased security enhancements.